EXETER – With the regular season drawing to a close the Exeter Monarchs once again find themselves near the top of the Central Sequoia League standings. Just one game out of first place with four to play their match against Kingsburg on Wednesday, Jan. 31, was a must win. Exeter did just that by winning 1-0 in a game that held more missed chances, and physical play. Only seven minutes into the first half Exeter got the deciding goal. Off an Exeter throw in the ball was deflected into the penalty box. As the ball bounced from foot to foot it was hit further inside to the goalie box. There Exeter’s Salvador Zamora, who had some open space, turned and buried the ball into the net. “He always puts himself in great positions to score, and he’s even been on a little scoring streak here so far,” Renteria said. Exeter (12-9-1,7-3) kept the offensive pressure on the Vikings for much of the remaining time of the first half. In that time they produced two more solid scoring chances. Ricardo Isais charged through the middle of the defense, and with one guy left he kicked the ball toward the left post. However, it bounced further left than anticipated, going wide. The second was a shot by Jaime Lara that bounced off the post. 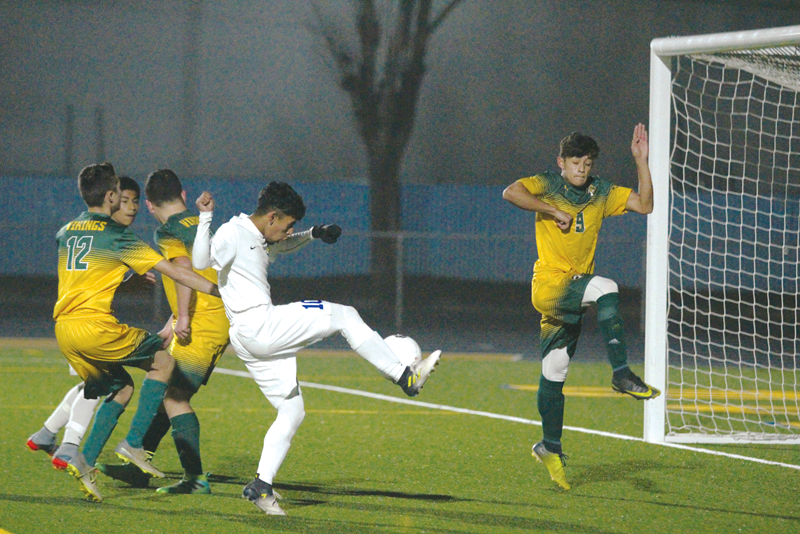 While Exeter tried to score it seemed Kingsburg was more focused on pushing the limits of what was a foul. Most times the extra push, or jersey pull when an Exeter attacker ran by was not called. Even an elbow to the back of an Exeter mid-fielder, who had jumped to contest a header, let go. Toward the end of the first half things began to boil over. Exeter went on the attack one last time in the half. As they took the ball down three Viking defenders forced the attacker toward the baseline. The four players battled for the ball. That was until a defender grabbed the Exeter player by the shoulders, and threw him to the side. Once again there was no call. In the second half the physical play began to catch up with the Vikings. Lara brought another attack into the offensive zone. While he made a move toward the goal he was fouled resulting in a penalty shot, the first of two for Exeter in the second half. Lara took his own attempt which was stopped with the right hand while Henry Wildes dove to his right. The rebound came right back to Lara as the other players charged in from beyond the penalty box. Rushed Lara launched the shot wide. The second penalty kick was the result of a hand ball inside the penalty box. Wildes also had to dive to save the shot, only this time to his left. “We dominated on the chances, but just wasn’t able to finish,” Renteria said. The night was also the last home game for 10 seniors. Orlando Cisneros was one of the ten. While he was happy for the win, he knows that him and his teammates can play better. “We got the win, but we gave them a few more opportunities there at the end,” Cisneros said. Late game chances are something that the Monarchs cannot afford going into the final week of the season and to D-VI playoffs. Currently Exeter is projected to have the third seed in the bracket. They will look to improve on that by getting a win tonight on the road against the Central Valley Christian Cavaliers. Kickoff is scheduled for 6 p.m.